Lack of reliable, nonintrusive disclosure techniques remains an obstacle in child abuse investigations. Stimulus equivalence procedures have been used to detect a range of social experiences. This paper explores the role that contextual cues play in the development of these procedures. 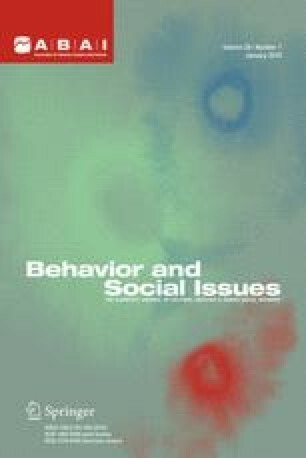 Eight 6–9-year-olds were exposed to verifiable social experiences and then trained to respond differentially to two arbitrary stimuli. Phases 1–3 of the experiment began with a role-play in the laboratory. In Phase 1, the role-play was followed by conditional discrimination training; selecting arbitrary stimulus (*) in the presence of pictures depicting unusual activities in the role-play was reinforced, while selecting arbitrary stimulus (!) in the presence of other role-play stimuli was reinforced. In Phase 2, the role-play was followed by a testing procedure. In Phase 3, the two arbitrary stimuli were established as contextual cues. Following the role-play, accurate disclosure was reinforced in the presence of (*), while inaccurate disclosure was reinforced in the presence of (!). In Phase 4, a prearranged role-play took place at each child’s home. Using the arbitrary stimuli as contextual cues, children were tested for accurate and inaccurate verbal accounts. All subjects achieved 100% correct responses in Phases 1–3. Four of the 8 subjects scored 100% in Phase 4, whereas the remaining subjects scored between 67% and 94%. Findings are discussed in the context of child abuse. An earlier version of this paper was presented at the Fourth European Meeting of the Experimental Analysis of Behaviour, July 2000, Amiens, France.